Despite the great contributions of utilizing heterosis to crop productivity worldwide, the molecular mechanism of heterosis remains largely unexplored. Thus, the present research is focused on the grain number heterosis of a widely used late-cropping indica super hybrid rice combination in China using a high-throughput next-generation RNA-seq strategy. Here, we obtained 872 million clean reads, and at least one read could maps 27,917 transcripts out of 35,679 annotations. 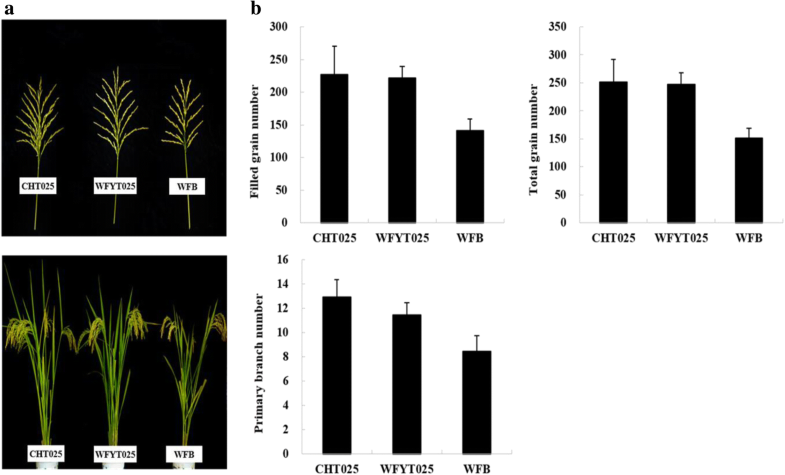 Transcript differential expression analysis revealed a total of 5910 differentially expressed genes (DGHP) between super-hybrid rice Wufengyou T025 (WFYT025) and its parents were identified in the young panicles. Out of the 5910 DGHP, 63.1% had a genetic action mode of over-dominance, 17.3% had a complete-dominance action, 15.6% had a partial-dominance action and 4.0% had an additive action. DGHP were significantly enriched in carotenoid biosynthesis, diterpenoid biosynthesis and plant hormone signal transduction pathways, with the key genes involved in the three pathways being up-regulated in the hybrid. By comparing the DGHP enriched in the KEGG pathway with QTLs associated with grain number, several DGHP were located on the same chromosomal segment with some of these grain number QTLs. Through young panicle development transcriptome analysis, we conclude that the over-dominant effect is probably the major contributor to the grain number heterosis of WFYT025. The DGHP sharing the same location with grain number QTLs could be considered a candidate gene and provide valuable targets for the cloning and functional analysis of these grain number QTLs. Heterosis is a phenomenon in which hybrids exhibit superiority over their parental lines in economic traits, such as enhanced biomass production, development rate, stress tolerance and, most important, grain yield. Heterosis has been extensively used to increase crop productivity throughout the world. A major increase in rice yield was caused by the application of heterosis. Because of the key role of heterosis, the molecular mechanisms should be elucidated. In the early twentieth century, dominance (Davenport 1908) and over-dominance (Shull 1908) were used to explain heterosis. However, with nothing about molecular concepts being covered, consequently, they cannot interpret the molecular genetic mechanisms of heterosis (Birchler et al. 2003). With the development of polymerase chain reaction (PCR), molecular markers have been widely used to identify the distance between the hybrid and its parents and to build the relationship between heterosis and genetic distance. However, marker PCR can only be used to classify heterotic groups and determine genetic diversity, but it cannot predict heterosis because the coefficient of the relationship between the genetic distance of SSR markers and yield heterosis is very small (Xu et al. 2009). Subsequently, molecular markers and hybrid genetic analysis have been used to locate QTLs for heterosis. A Pioneer study of the heterosis gene qGY2–1 related to yield was reported in haplotype populations (He et al. 2006). To eliminate the epistasis effect among QTLs, Bian et al. (2011) used chromosome segment substitution lines (CSSLs) to study heterosis for yield traits in indica × japonica hybrid rice subspecies. With the advent of high-throughput sequencing technology, scientists conducted DNA sequencing of 1495 elite hybrid rice varieties and their inbred parental lines. Comprehensive analyses of heterozygous genotypes have revealed that heterosis mainly resulted from the accumulation of numerous superior alleles with positive dominant effects (Huang et al. 2015). In addition, the association of heterosis with differentially expressed transcripts was also investigated at the RNA level. Wei et al. (2009) investigated differentially expressed transcripts from tissues at different growth development stages using super rice LYP9 and its parents and found that the differentially expressed transcripts were closely related to QTLs in response to heterosis. Huang et al. (2006) used 9198 unique sequence tags to study gene differential expression profiles of young panicles using the super rice SY63 combination and suggested that transcripts controlling DNA repair and replication were up-regulated and that the genes related to carbohydrate, energy and lipid metabolism, translation and protein degradation were down-regulated. High-throughput RNA sequencing has been used to search for heterosis in rice to avoid defects of methods with low throughput, high cost, low sensitivity, clonal preference, and high background noise. RNA-seq was first used to compare the transcriptome profiles of reciprocal hybrids from Nipponbare and 93-11, along with their parents, at the seedling stage. In total, 2800 genes showed differential expression, and these transcripts were involved in energy metabolism, especially in the Calvin cycle, in which six key components were up-regulated (He et al. 2010). Later, Zhai et al. (2013) compared the transcriptome between super hybrid XY9308 and its parents through RNA-seq, which indicated that carbohydrate metabolism and plant hormone signal transduction were enriched in differentially expressed transcripts. 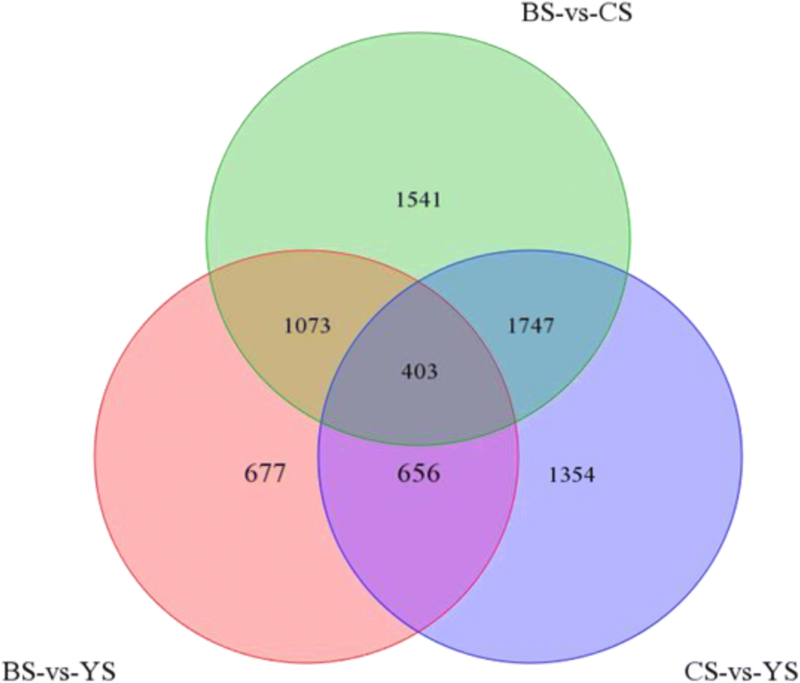 In this study, we focused on heterosis in the rice WFYT025, a widely used late-cropping indica super hybrid rice combination in China. The number of filled grains, one of the most important yield heteroses in yield contributing factors, showed great differences between WFYT025 and its female parent. Thus, we conducted transcriptome analysis using young panicles from the WFYT025 combination by high-throughput RNA-seq to detect the correlation of key transcripts with filled grain number heterosis. Some key transcripts were mapped in the QTL interval related to grain number. Revealing the function of these transcripts may provide useful information for understanding the molecular mechanism underlying heterosis. In this study, we investigated the yield-related traits of WFYT025 and its parents. It was found that the panicles of WFYT025 and its male parent CHT025 were larger than those of the female parent WFB, and their grain number and primary branch number were also higher than those in WFB (Fig. 1a and b). However, no significant differences were observed between WFYT025 and parental line CHT025 for both grain number and primary branch number (Fig. 1b). Mid-parent heterosis (MPH) and higher parent heterosis (HPH) were estimated for the heterosis of panicles. The MPH for all of the traits except the seed setting ratio and tiller remained significant (Table 1). Traits such as primary branch number, secondary branch number, filled grain number, empty grain number and 1000-grain weight were significant for the MPH at p < 0.05, while traits such as spike length, total grain number and yield per plant were highly significant at p < 0.01. The MPH showed negative effects on the seed setting ratio. Apart from the seed setting ratio and empty grain number, the MPH values for all of the traits varied from 1.16 to 32.32%. In addition, HPH for yield per plant remained highly significant (22.99%) at the p < 0.01 level. Further analysis indicated that significant difference for yield per plant was mainly due to the large MPH range for filled grain numbers (20.01%) and 1000-grain weight (6.25%). This implied that compared to the 1000-grain weight, the yield heterosis was more likely to underlay the filled grain number between hybrid WFYT025 and maternal line WFB. A total of 917 million raw reads were generated using the high-throughput Illumina HiSeq 2500 platform. The paired-end sequences with low-quality reads containing adapters were trimmed off. Finally, 87.2 million clean reads were obtained (Table 2). 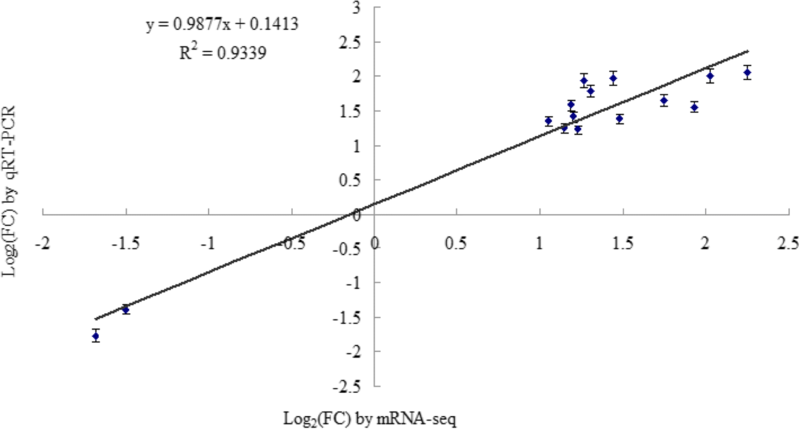 The correlation for the gene expression level from three biological replicates of each line was 0.97 < R2 < 0.99. (Additional file 1: Figure S1). We pooled the short reads and aligned them to the Nipponbare reference genome (IRGSP v1.0) to identify the transcripts. Out of 35,679 identified transcripts, 27,917 transcripts were mapped, covering 78.24% of the genome. In addition, the transcriptome profile of WFYT025 was similar to that of its female parent WFB (Fig. 2). To validate the results of mRNA sequencing data, the expression of a subset of 15 randomly selected DGHP was determined by qRT-PCR. The list of primer sequences is presented in Additional file 2: Table S1. The results obtained from qRT-PCR and RNA-seq were compared, and expression trends were consistent for all transcripts in both analyses; the correlation coefficient (R2) was 0.9339 (Fig. 3). We adopted reads per kilobase million reads (FPKM) to measure gene expression levels. Two criteria were considered to identify putative DEGs: (1) the false discovery rate (FDR) should be ≤0.05 and (2) the fold change (FC) should be ≥2. Following these criteria, 4160 DEGs have been identified between paternal line CHT025 and WFYT025. Of these, 2155 DEGs were up-regulated and 2005 were down-regulated. Additionally, 2809 DEGs were identified between maternal line WFB and WFYT025, of which 1463 DEGs were up-regulated and 1346 DEGs were down-regulated (Table 3). For a detailed comparison, the FPKM of all transcripts is presented in Additional file 3: Table S2. DEGs between parents are designated DGPP, and DEGs among the hybrid and parents are designated DGHP. DGHP may be relevant to heterosis because differences in expression between hybrids and parents should underlie their phenotypic differences. While DGPP only refers to the differences among the two parental lines (Song et al. 2010), there are still 3223 DGHPs that overlapped with DGPP, which indicates that these DGPP are also associated with heterosis (Fig. 4). In addition, 1059 DGHPs were shared between the hybrid and both of its parents. Using the method to evaluate the mode of inheritance, DGHP were classified into four expression patterns: over-dominance (Hp ≤ − 1.2 or Hp > 1.2), dominance (− 1.2 < Hp ≤ − 0.8 or 0.8 < Hp ≤ 1.2), additive effect (− 0.2 < Hp ≤ 0.2), and partial dominance (− 0.8 < Hp ≤ − 0.2 or 0.2 < Hp ≤ 0.8) (Additional file 4: Table S3). As shown in Fig. 5, these data suggested that the over-dominant effect, dominant effect, partially dominant effect and additive effect accounted for 63.1%, 17.3%, 15.6% and 4.0%, respectively. We applied Gene Ontology (GO) to classify the function of the mRNA. Using Web Gene Ontology Annotation Plot (WEGO) software (Ye et al. 2006), we distributed 5910 DGHP into at least one term in the GO molecular function, cellular component, and biological process categories. Further analysis showed that 5910 DGHP were present in 54 functional subcategories at a significance level of p < 0.05 (Fig. 6). In the cellular function category, cells and cell parts were mainly divided in the groups. For the molecular function category, DGHP was enriched with binding and catalytic activity. With respect to biological processes, cellular and metabolic processes were highly enriched in DGHP. We further analysed the GO terms of DGHP enriched with the biological process subcategories. These GO terms, including response to stimulus, cell proliferation, carbohydrate metabolic process, organ formation, and gibberellin biosynthetic process, may underlie heterosis in the young panicle of WFYT025 (Tables 4 and 5). For the identification of metabolic pathways in which DGHP were involved and enriched, the Kyoto Encyclopedia of Genes and Genomes pathway database was used. In total, 118 pathways were identified in 613 DGHP (between paternal line CHT025 and hybrid line WFYT025). 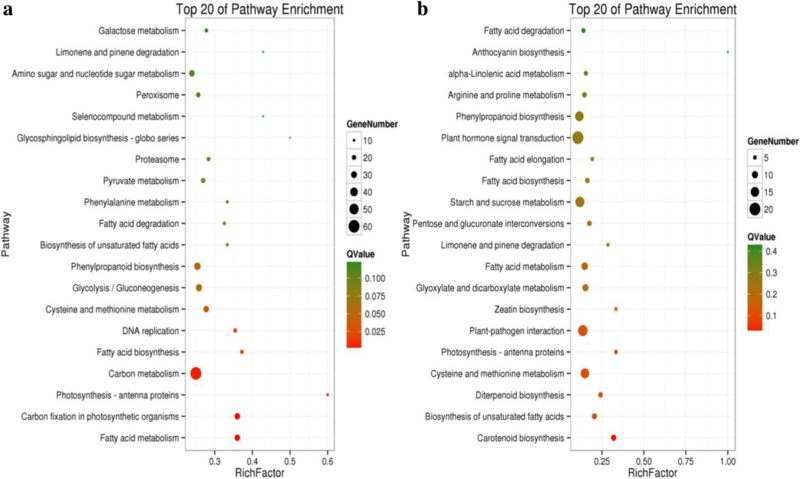 The top 20 most enriched pathways mainly covered carbon fixation in photosynthetic organisms, DNA replication, fatty acid biosynthesis and metabolism, and phenylpropanoid biosynthesis (Fig. 7a). In contrast, 268 DGHP between maternal line WFB and WFYT025 were classified into 107 pathways, and the top 20 most enriched pathways were mainly concentrated in plant hormone signal transduction, carotenoid biosynthesis, diterpenoid biosynthesis, zeatin biosynthesis, and cysteine and methionine metabolism with a significance level of p < 0.05 (Fig. 7b). This suggests that the considerable differences in young panicles between WFB and WFYT025 may be related to hormone regulation. We were able to map the DGHP that were significant in the KEGG analysis (P < 0.05) between WFYT025 and WFB for the QTLs associated with grain yield in the rice genome (http://www.gramene.org). As shown in Table 6, a total of 36 transcripts were mapped in the interval of 22 yield-related QTLs, including 15 grain number QTLs, 6 1000-grain weight QTLs and 1 yield per plant QTL. Most genes shared the same location with one yield-related QTL. However, Os03g0856700 corresponded to qGP3–1 for grain number and qSNP-3b for spikelet number per panicle. Os04g0229100 was mapped to the same loci as qGwt4a for 1000-grain weight and qSNP-4a for spikelet number per panicle, while Os04g0578400 and Os04g0608300 shared the same chromosome segment with qGPP-4 for grain number per panicle and qSNP4–1 for spikelet number per panicle. Though heterosis has been extensively exploited in plant breeding and plays an important role in agriculture, the molecular and genetic mechanisms underlying this phenomenon remain poorly understood. Differential gene expression between a hybrid and its parents may be associated with heterosis (He et al. 2010; Kim et al. 2013; Zhang et al. 2008). Here, we investigated the relationship between transcriptional profiles and heterosis in super hybrid rice WFYT025 by RNA-Seq. Using RNA-Seq analysis, 872 million high-quality paired-end reads of 150 bp were generated from the panicles of WFYT025 and its parental lines at the panicle differentiation stage, and 27,917 annotated transcripts were identified. Of these transcripts, 4160 DGHP between hybrid WFYT025 and paternal line CHT025 and 2809 DGHP between hybrid WFYT025 and maternal line WFB were identified. The filled grain number heterosis exhibited significant differences between WFYT025 and WFB; however, there were no significant differences between WFYT025 and CHT025 (Fig. 1b, Table 1). Therefore, the results suggest that the expression of DGHP between WFYT025 and WFB at the young panicle development stage may play an important role in grain number heterosis compared to that between WFYT025 and CHT025. Therefore, focusing on the expression of DGHP between WFB and WFYT025 might find an association between DGHP and heterosis for filled grain number. We have been able to identify a number of DGHPs underlying grain number between hybrid WFYT025 and maternal line WFB, confirming the suggestion that heterosis is a polygenic phenomenon (Kusterer et al. 2007; Bian et al. 2011). Among the DGHP, 17.3% had a dominant effect, 15.6% had a partial dominant effect, 4% had an additive effect and the remaining 63.1% had an over-dominant effect. Thus, over-dominance was the major contributor to the heterosis of WFYT025. Meanwhile, the expression differences of cloned yield trait genes have been investigated between the hybrid and its parents. Of the 143 genes related to grain yield traits, 11 genes, accounting for 7.7%, showed over-dominance; 12 genes, accounting for 8.3%, showed dominance; 71 genes, accounting for 49.6%, showed partial dominance; and 49 genes, accounting for 34.4%, showed partial dominance (Additional file 5: Table S4). It is well known that hormones act as signalling molecules in plants and can regulate physiological responses. 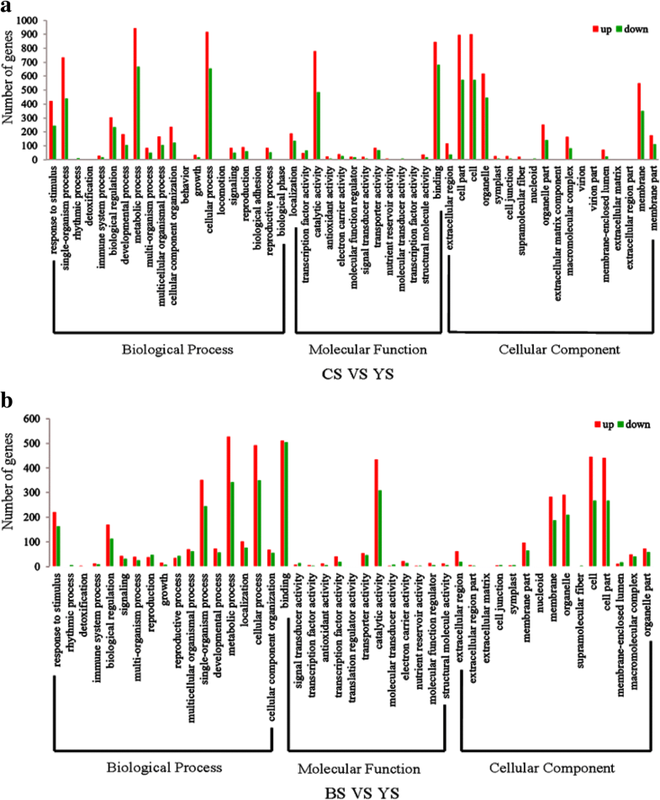 Transcriptome analysis has uncovered many DGHPs that are involved in the phytohormone response in young panicle tissue. For example, mRNA levels of Os12g0586100 encoding SNF1-related protein kinase2 (SnRK2), whose autophosphorylation is required for kinase activity towards downstream targets, were expressed poorly in WFYT025 compared to its parents. In addition, type-2C protein phosphatase (PP2C, a negative regulator) (Os01g0846300, Os05g0572700, Os01g0656200 and Os03g0268600) was up-regulated, and a similar observation was also reported by Merlot et al. (2001) and Zhai et al. (2013). These results are consistent with the negative-feedback regulatory mechanism in ABA signal transduction. Moreover, transcripts involved in the gibberellin (GA) biosynthesis pathway were also differentially expressed between the hybrid and its two parents, in this study. GAs are a large family of diterpenoid compounds, some of which are bioactive growth regulators that control flower development (Cowling et al. 1998). GAs are involved in the transformation of vegetative reproduction to reproductive growth (Poethig 1990; Evans and Poethig 1995). OsGA20ox1 (Os03g0856700) encodes a GA20 oxidase, which is the key enzyme that catalyses the penultimate step reaction of gibberellin biosynthesis and enhances the grain number of rice by increasing the cytokinin activity in the rice panicle meristem (Wu et al. 2016). In this study, we observed that the expression level of OsGA20ox1 in WFYT025 is up-regulated 2-fold higher than in WFB and showed over-dominance (Additional file 5: Table S4). This suggested that WFYT025 may possess strong potential for gibberellin biosynthesis compared to maternal line WFB, which promoted the amount of spikelet primordium in hybrid line WFYT025. We compared the significantly enriched DGHP to grain yield QTLs. As shown in Table 6, among the DGHP-correlated QTLs, many QTLs were well characterized, including those for grain per panicle (e.g., qGP-1a (Yu et al. 1997), qNG-1 (Lin et al. 1996), qGP3–1 (Li et al. 2001), qGPP-4 (Xiao et al. 1996), qGP-6 (Hua et al. 2002), qGP-7a (Li et al. 2000)); number of spikelets on secondary branches per panicle (e.g., qSSBP1–1 (Cui et al., 2002)); spikelet number per panicle (e.g., qSNP-3b (Xu et al. 2001), qSNP-4a (Mei et al. 2006), qSNP4–1 (Takai et al. 2005), qSP6–1 (Zhuang et al. 2001), qSNP-6 (He et al. 2001), qNFPB-11 (Yamagishi et al. 2004)); spikelet density (e.g., qSD-15 (Li et al. 1998) and qSSD-10 (Xiao et al. 1996)); 1000-grain weight (e.g., qgw362 (Ishimaru 2003), qGW3.1 (Thomson et al. 2003), qGwt4a (Lin et al. 1995), qKw5 (Li et al. 1997), qGw-6 (Lu et al. 1996), and qGw7 (Li et al. 2000)); and yield per plant (e.g., yd7a (Li et al. 2000)). The potential association between DGHP and QTLs was also suggested within many QTL regions, including putative protein phosphatase 2C (Os01g0846300) with qSSBP1–1 for the number of spikelets on secondary branches per panicle and putative transketolase (Os05g0408900) with qSD-15 for spikelet density. Interestingly, OsGA20ox1 (Os03g0856700), which is related to gibberellin biosynthesis, is located in both qGP3–1 for the number of grains per panicle and qSNP-3b for the spikelet number per panicle. Putative fatty acid hydroxylase (Os04g0578400), which is involved in carotenoid biosynthesis, and OsSAUR20-Auxin-responsive SAUR gene family member (Os04g0608300) was shared in both qSNP4–1 for spikelet number per panicle and qGPP-4 for number of grains per panicle. Except for a small number of cloned genes, such as Os01g0788400, Os02g0697400, Os02g0771600, OsGA20ox1 (Os03g0856700), Os03g0760200, Os03g0645900, Os04g0474800, Os04g0522500, Os04g0556500, Os05g0380900, Os07g0154100, and Os07g0155600, the remaining genes(including Os01g0846300, Os05g0408900, Os04g0578400 and Os04g0608300), which have been located in grain yield QTLs (including grain number, 1000-grain weight, and yield), were not cloned. 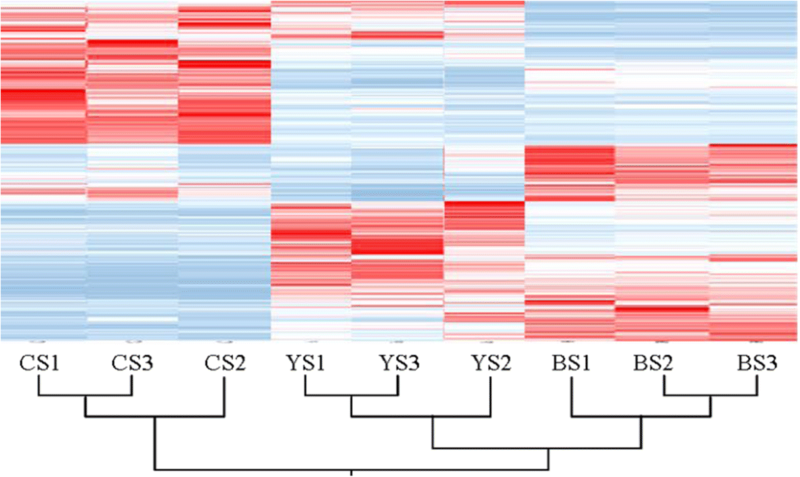 Studying the function of these candidate transcripts in these QTL regions may increase the knowledge of the molecular mechanisms underlying heterosis. Since transcripts are always under different levels of regulation, such as transcription and splicing through genetic or epigenetic mechanisms, the detailed sequence comparisons and validations for different alleles of annotated DGHP are not suitable to display in this current report. Transcription factors (TFs) are certainly one of the causes of gene expression fluctuations. In this study, we indeed found that 51 TFs showed significant differential expression in the hybrid compared with the maternal line (Additional file 6: Table S5). It is a coincidence that a previous study also proposed that altered gene expression caused by interactions between transcription factor allelic promoter regions in hybrids was one reasonable mechanism underlying heterosis in rice (Zhang et al. 2008). Furthermore, among the 51 TFs, we found that LAX1, which is the main regulator involved in the formation of axillary bud primordium in rice, is overrepresented in the hybrid (Komatsu et al. 2003). MADS-box 55 (MADS50) was up-regulated significantly, and MADS-box 56 (MADS56) was down-regulated in the hybrid compared to the maternal line (Additional file 6: Table S5). This is consistent with a previous study that suggests that OsMADS50 and OsMADS56 function antagonistically in regulating LD-dependent flowering (Ryu et al. 2009). Certainly, except for 21 reported TFs, the remaining 30 novel TFs might play an important role in the young panicle and grain number heterosis. In this study, we systematically investigated the transcriptome profiles from super-hybrid rice WFYT025 combinations for young panicles at the panicle differentiation stage by deep high-quality sequencing. We obtained a large amount of DGHP and found that the over-dominance effect is the main mode of inheritance for DGHP. Comparing the significantly enriched DGHP (P < 0.05) between WFYT025 and WFB with QTLs in response to grain number, we found some candidate transcripts that may contribute to the increase in grain yield. Exploring these candidate transcripts will provide new opportunities for revealing the heterosis of grain yield. The hybrid WFYT025 along with its parental lines Changhui T025 (CHT025) and Wufeng B (WFB) were planted in the experimental field of Jiangxi Agricultural University. WFYT025 is a super-hybrid rice combination derived from the cross between female parent WFB and male parent CHT025. WFYT025 and the two parents were sown at the experimental plot in Jiangxi Agricultural University in a completely randomized block design with three replications in autumn 2016. Each plot consisted of 50 rows, with each row consisting of 10 plants, each separated from its neighbour by 20 cm. Crop management followed normal procedures for rice. These three lines were selected in this study to measure phenotypic traits and conduct transcriptome analyses. At maturity time, panicles were selected with ten replicates for the estimation of heterosis. The young panicles at the differentiation stage were collected and stored at − 80 °C for RNA-Seq analysis, and each sample had at least three biological replications to minimize systematic errors. To determine 1000-grain weight, panicles were dried in an oven at 42 °C for 1 week. Panicle length, primary branch, secondary branch, number of filled grains and total grain number were measured manually. Mid-parent heterosis (MPH) and higher parent heterosis (HPH) were calculated for these traits according to the following formulas: MPH = (F1 − MP) / MP and HPH = (F1 − BP) / BP, where F1 is the performance of the hybrid, MP is the average performance of the two parents and BP is the performance of better parents. Hypothesis testing was performed using a t-test. Total RNA was extracted from rice panicles using Trizol reagent (Invitrogen, Carlsbad, CA, USA) and purified using an RNeasy Plant Mini Kit (Qiagen, Valencia, CA, USA) according to the manufacturer’s instructions. The quality and integrity of RNA were tested using an Agilent Bioanalyzer 2100 system (Agilent, Santa Clara, CA, USA); RNA Integrity Number (RIN) values were greater than 8.5 for all samples. After total RNA extraction, eukaryotic mRNA was enriched by Oligo (dT) beads, while prokaryotic mRNA was enriched by removing rRNA using the Ribo-Zero TM Magnetic Kit (Epicentre). Then, the enriched mRNA was fragmented into 200-bp segments using fragmentation buffer and reverse transcribed into cDNA with random primers. Second-strand cDNA synthesis was subsequently performed using DNA polymerase I, RNase H, dNTP and buffer. Then, the cDNA fragments were purified with QIAquick PCR extraction kit, end repaired, poly (A) added, and ligated to Illumina sequencing adapters. The ligation product size was selected by agarose gel electrophoresis, PCR amplified, and sequenced with 100 cycles of paired-end sequencing (2 × 150 bp) using Illumina HiSeq TM 2500 by Gene Denovo Biotechnology Co. (Guangzhou, China). The processing of fluorescent images into sequences, base-calling and quality value calculations were performed using the Illumina data processing pipeline (version 1.8). The sequence reads were submitted to the NCBI Sequence Read Archive (SRA, http://www.ncbi.nlm.nih.gov/sra) under the accession number SRP127997. Raw reads generated from high-throughput sequencing were treated as follows. First, to remove adapters that were added for reverse transcription and sequencing, sequences with too many unknown bases (>10%) and low-quality bases (>50% of the bases with a quality score ≤ 20) were removed. The reads mapped to the ribosome RNA (rRNA) database were removed with the read alignment tool Bowtie 2 (Langmead and Salzberg 2012). The remaining reads of each sample were then mapped to the Nipponbare reference genome (IRGSP build 1.0) by TopHat2 (version 2.0.3.12) (Kim et al. 2013). The parameters for alignment were set as follows: 1) the maximum read mismatch should be 2; 2) the distance between mate-pair reads should be 50 bp; 3) the error of distance between mate-pair reads should be ±80 bp. Differential expression was estimated and tested using the software package edgeR (R version: 2.14, edge R version: 2.3.52) (Robinson et al. 2010). We quantified gene expression levels in terms of fragments per kb for a million reads (FPKM) (Mortazavi et al. 2008), calculated the false discovery rate (FDR), and estimated the fold change (FC) and log 2 values of FC. Transcripts that exhibited an FDR ≤ 0.05 and an estimated absolute log2(FC) ≥ 1 were considered to be significantly differentially expressed. For statistical analysis, the analysis of variance (ANOVA) was usually by the model: y = u + (GA) + (GD) + (SR) + e, where y is the acquired gene expression, u is the overall mean, GA is the additive effect, GD is the dominant effect, SR is the replication effect, and e is the residual error (Lynch and Walsh 1998). Hp = [d]/[a], referred to as the dominance ratio or potency (where [a] and [d] represent GA and GD, respectively), was also calculated to measure the non-additivity of the F1 hybrid relative to its parents (Griffing 1990). Considering gene expression levels as quantitative traits, we adopted traditional quantitative genetic parameters, such as composite additive effect [a] and composite dominance effect [d], to estimate our expression profile. DGHP were classified according to the dominance ratio Hp (= [d]/[a]), based on 99.8% confidence intervals constructed for [d] - [a] ([d] > 0) and [d] + [a] ([d] < 0). According to the value of Hp (=[d]/[a]), we considered that these genes belonged to partial dominance (− 0.8 < Hp ≤ − 0.2 or 0.2 < Hp ≤ 0.8), over-dominance (Hp ≤ − 1.2 or Hp > 1.2), dominance (− 1.2 < Hp ≤ − 0.8 or 0.8 < Hp ≤ 1.2) and additive effect (− 0.2 < Hp ≤ 0.2) (Stuber et al. 1987, Bian et al. 2011). Cluster analysis of all annotated transcripts from the hybrid and its parents was performed. The FPKM-normalized expression counts for each transcript were clustered with the software Cluster 3.0, and the results were visualized using Treeview (Eisen et al. 1998). The expression of genes with differential expression (DEGs) and results of RNA sequencing were validated by quantitative real-time PCR. Total RNA from nine samples (including three biological replicates) was extracted using the Prime Script™ RT reagent Kit with gDNA Eraser according to the manufacturer’s instructions. SYBR-based qRT-PCR reactions (SYBR Green I, Osaka, Japan) were performed on an ABI VIIA@7 using the following thermal cycling conditions: 50 °C for 2 min; 95 °C for 5 min followed by 40 cycles at 95 °C for 15 s and 60 °C for 34 s. All qRT-PCR reactions were performed in triplicate samples, and the results were analysed with the system’s relative quantification software (ver. 1.5) based on the (ΔΔCT) method. The detection of the threshold cycle for each reaction was normalized against the expression level of the rice Actin1 gene with the primer sequences 5′-TGGCATCTCTCAGCACATTCC-3′ and 5′-TGCACAATGGATGGGTCAGA-3′. Liang Chen, Jianmin Bian and Shilai Shi contributed equally to this work. We thank the anonymous referees for their critical comments on this manuscript. This research was supported by grant (2016YFD0101801) from The National Key Research and Development Program of China and Technology Department, grant (31560386) from National Nature Science Foundation of China and grant (201710410018) from National Undergraduate Training Program for Innovation and Entrepreneurship. The clean data with high quality in this study have been deposited into the NCBI Sequence Read Archive under the accession number of SRP127997. HH and JB conceived and designed the experiments. LC conceived and designed the experiments, and wrote the manuscript. SS and JY performed the experiments. CZ, LX, ST, XY, XP, QY, XH, JF, XC, LH, LO analyzed the data. HK and GMW revised the manuscript for the language. All authors read and approved the final manuscript.